One of the peculiarities of obituaries in archive editions of The Engineer is that they often don’t cover what you might expect them to. We remember George Westinghouse as the father of alternating current, and for his ‘war of the currents’ with Thomas Edison, who was a proponent of direct current, believing it safer. It’s a colourful story, taking in as it does the deliberate electrocution of an unfortunate elephant called Topsy (by Edison). The Engineer’s lengthy obituary of Westinghouse doesn’t mention rivalry with Edison once; indeed it hardly mentions AC at all. In fact, the bulk of the obituary is dedicated to one of Westinghouse’s earlier inventions: the railway air brake. Westinghouse began to think about this when he was about 20, after he was delayed for two hours between his home in Schenectady, New York and the Bessemmer Steel plant in Troy, New York, by the collision of two freight trains. ‘The loss of time and inconvenience arising from this accident suggested that if the drivers of the two trains had had some way of applying brakes to all the wheels the accident might never had happened’ the obituary says. While thinking of ways this might be achieved, Westinghouse read about the construction of the Mont Cenis Tunnel, the first large tunnel under the Alps. This was done using newly-invented compressed-air drills, which quintupled the rate of progress the tunnelers had made using hand drills. At the time, Westinghouse had been experimenting unsuccessfully with powering his brake using steam, but he quickly switched to pneumatics, and filed a patent for his invention in 1867, when he was just 22 (his first of over 250 patents). Characteristically, he then started a company to make and sell his brakes, and quickly made his first sale to the Pennsylvania and Panhandle Railroad. As it happens, in the first trial of the system, the driver used the brake to avoid hitting a horse on the track. The obituary mentions that Westinghouse had a talent for spotting and befriending talented engineers, and getting them to work with him. It picks out Nicola Tesla, whose three-phase motors Westinghouse put on the market; Oliver Shallenberger, who invented the watt-hour meter; and Charles Scott, inventor of three to two—phase transformers. 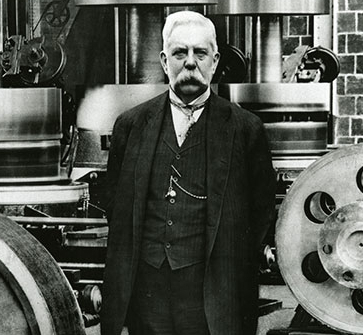 Read our obituary of George Westinghouse here. What a great read George Westinghouse’s original obituary is! Westinghouse is now an even bigger hero and inspiration for me — a giant among giants. It seems he was the Elon Musk of his time. What a thought that would be — to have these two minds working together in today’s circumstances. Or even locked in competition. Thanks for drawing attention to this. Very Much Appreciated! Yes, Westinghouse was a smart fellow indeed, but was yet another that basically rooked Tesla out of his due accolades and money. Sorry, but I am not into worshiping the man.